As work gloves become more sophisticated and specialized, finding the best value depends on how well you understand the users’ needs and the risks they face. I don’t play much golf, but I marvel at the variety of clubs for sale in sporting goods stores. The golf industry has reached a level of sophistication where golfers with enough money can find the set of clubs that will capitalize on their strengths and minimize their weaknesses. And all this so a man or woman can whack a ball into a hole with the least number of strokes and fewest detours into water, trees or sand traps. Sophistication has taken hold of every aspect of modern life. The cars we drive, the phones we use, even the coffee we drink, all are more feature packed and specialized to suit our needs and preferences. And, just like the golf clubs, if you have enough money, you can find the car, phone, or coffee drink perfectly suited to your tastes and requirements. So, let’s talk about work gloves. How does sophistication and specialization affect your ability to maximize the safety and efficiency of your staff, and how much does all this sophistication cost? Advances in technology are only useful if we are able to apply them effectively. There is no benefit to all this sophistication if you don’t understand it, or if you haven’t take the time to identify the specific challenges facing your workers. If I did play golf more, I would seek out an expert to match me to the clubs that suited my playing style so my investment would be well spent. Similarly, I strongly recommend having an experienced safety consultant help you determine the best choices for your gloves. Based on these findings, your consultant will be able to recommend a range of choices which you can trial to see which works best. We have more and more data available to us to help evaluate the protective properties of gloves, but these are not necessarily definitive. There are a lot of situations where the glove that looks best on paper will not perform as well in real life. A glove that scores well against your target risks might be so uncomfortable to wear that it will be removed at every opportunity or cause unnecessary fatigue. This is counterproductive to a safe work environment. A glove that is more comfortable to wear is going to be safer than the uncomfortable one even if it doesn’t score as high. When it comes to evaluation of cut- or puncture-resistant gloves, it’s critical to understand that the ratings advertised for the gloves may only apply to palm and fingers, and that the back of the glove may not be nearly as cut- or puncture- resistant as the front. 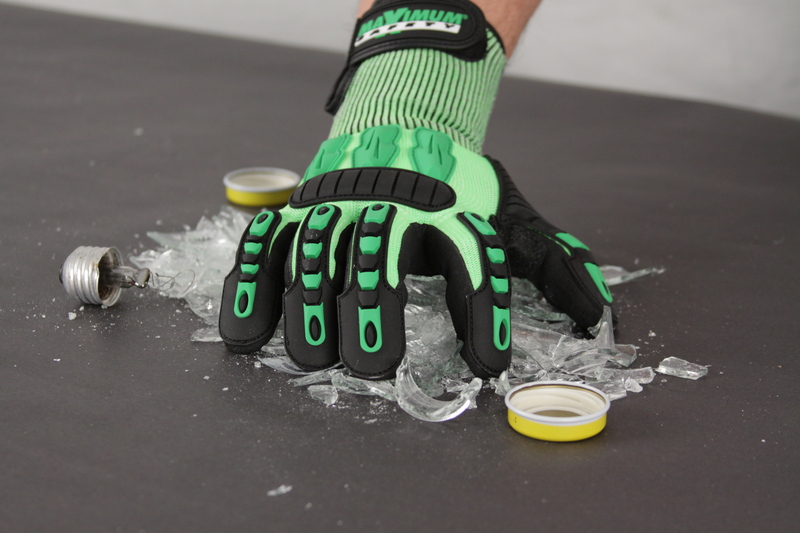 If protecting the back of the hand is an important factor for the task at hand, this will steer your selection toward gloves that have been designed for full hand protection. All of these unknowns can be answered by trials of a handful of gloves that have been selected to match the challenges faced in your workplace. Some conclusions will be apparent very quickly. Other factors, such as life of the glove and launderability, should also be well noted before making a final evaluation. Taking advantage of the growing sophistication in work gloves is not expensive if you buy gloves that are well-suited to your needs. There may be some tasks in your industry that require some very sophisticated gloves, and, yes, those gloves are expensive. Preventing a needle stick loss or some other high-risk injury is worth the expense for those who are exposed to those risks. Most of your staff will face less harrowing risks and, therefore, will not need that level of protection. By matching the glove precisely to the mechanical risk faced, you will pay no more than you need to be paying while sparing your company the expense of a preventable hand injury. 2 Subjecting the best glove choices to a trial often makes the best choice more obvious.